Tag line: "New!! Sinbad's Boldest And Most Daring Adventure!" 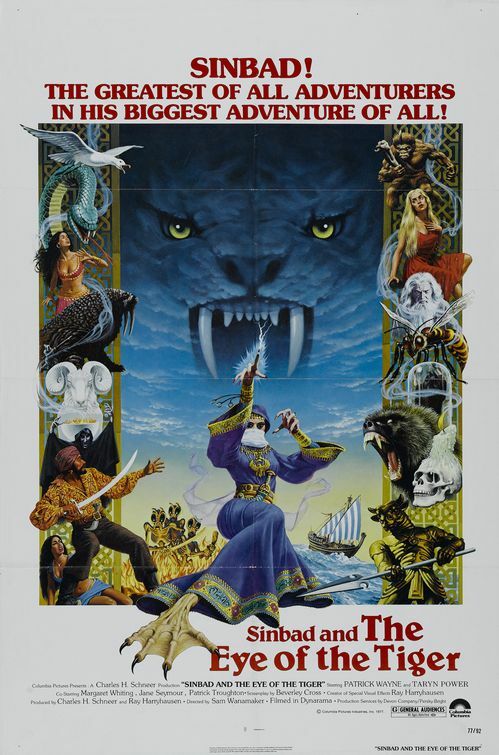 The third and final chapter in the Sinbad Trilogy, Sinbad and the Eye of the Tiger was released in 1977, the same summer that another fantasy film known as Star Wars (or Star Wars Episode IV: A New Hope) hit the scene. While Star Wars represented a leap forward in movie special effects, Sinbad and the Eye of the Tiger relied on stop-motion animation, which had been in use since the days of silent pictures. Fortunately, the man responsible for creating Sinbad’s effects was Ray Harryhausen, who, despite specializing in such a time-honored, "archaic" process, always found a way to make it seem fresh. Sinbad (played this time around by Patrick Wayne) has come to the port city of Charak to pay a visit to his good friend Prince Kassim (Damien Thomas) and his sister, Princess Farah (Jane Seymour), who also happens to be the famous sailor’s girlfriend. Arriving several days after the scheduled coronation of Kassim as Caliph, Sinbad assumes the Prince is now the city’s new ruler. But thanks to the evil witch Zenobia (Margaret Whiting), step-mother to the Prince and Princess, the coronation was never completed. It is Zenobia’s wish that her own son Rafi (Kurt Christian) be made Caliph, so as the crown was about to be put on Kassim’s head, she used her magic to turn the Prince into a baboon! With nowhere else to turn, Princess Farah begs Sinbad to help her brother. To this end, Sinbad gathers up his crew (as well as Kassim and Farah) and sets sail for the Greek island of Casgar, rumored home of the brilliant alchemist Melanthius (Patrick Troughton). Though unable to break Zenobia’s spell himself, Melanthius, who lives alone with his daughter Dione (Taryn Power), recommends they brave the icy waters of the North to visit the remains of the once-great city of Hyperborea, where an advanced race known as the Arimaspi resided. It’s Melanthius’ belief that the town’s sacred temple may house the secret to changing Kassim back to his former self. With time slipping away (if Kassim isn’t made Caliph by the seventh full moon, Rafi will be crowned instead), the group heads north, sailing as quickly as they possibly can. What they don’t realize, however, is Zenobia and Rafi, along with their mechanical servant the Minotaun, are following close behind, and intend to reach the Temple of Hyperborea before our heroes do. As with many of Harryhausen’s previous films (including the first two Sinbad movies, 7th Voyage and Golden Voyage), the best moments in Sinbad and the Eye of the Tiger feature his stop-motion magic. We get a few original creations, like the Minotaun (for the close-up scenes, actor Peter Mayhew, AKA Chewbacca in the Star Wars films, dons the Minotaun suit) and the Troglodyte, an ancestor of mankind’s that is several stories tall. Yet some of Harryhausen’s most impressive work involves not mythical creatures, but real-life ones; the animation he provides for the baboon version of Kassim is among his finest of all-time (there are moments when you believe you’re watching a real animal). And while Sinbad and his crew’s fight with the giant Walrus isn’t particularly exciting, the final battle, in which the Troglodyte squares off against a Sabretooth Tiger, is thrilling as hell. But along with the animation, I also enjoyed the adventure at the heart of Sinbad and the Eye of the Tiger. Sure, the story itself isn’t original (there are scenes that could have easily been lifted from earlier fantasy films), but it still managed to hold my undivided attention. In some of Harryhausen’s lesser movies, I found myself waiting impatiently for the animated sequences, and didn’t care as much about the quest at the heart of it all (Golden Voyage of Sinbad is one example). This was not the case with this Eye of the Tiger. With the ushering in of high-tech computer graphics, its tale of swordplay and ancient magic may seem antiquated to some, but I had a great time watching this movie. In fact, I’m kinda sad that Harryhausen didn’t have a fourth Sinbad film in him. Why didn't Survivor write the theme song for this movie instead? It would have made more sense than a Rocky movie. Ha ha. Seriously, good review. Now I am intrigued just for the Harryhausen effect.